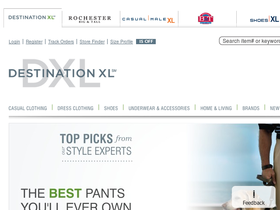 Destination XL, online at destinationxl.com, is a men's big and tall superstore. Destination XL offers casual clothing, dress clothing, pants, jeans, outerwear, activewear, tees and polos, sweaters, suits, dress coats, formal wear, underwear, shoes, accessories, hats, and more in classic and current styles. Destination XL also offers a great selection of home and living products, and carries brands like Kenneth Cole, Calvin Klein, Clarks, Carhartt, Rockport, Stacy Adams, Wrangler, New Balance, and many more. Plus, Destination XL offers great selections at discounted prices. So before you shop for great men's big and tall clothing and products, get all the latest destinationxl.com discounts, Destination XL promotions, and Destination XL coupon codes found here at RetailSteal.com. Destination XL ships within the continental United States, PO boxes, Alaska, Hawaii, APO/FPO, US territories and possessions, and international destinations. Expedited shipping options are available within the continental United States. See site for more information. Enjoy a $20 discount from Destination XL using this coupon code with purchases $200+. Save up to 85% on men's big and tall clothing on sale at Destination XL. Click here to shop and save. Save $15 on purchases of $100 or more online at Destination XL today when you enter our coupon code at checkout. Save up to 75% on dress shirts on sale at DestionationXL.com. Click here to shop. Get free shipping on select products when you take advantage of the ship to store option. Click to save. Visit 6pm.com and find luxury brand watches including Collection, Citizen, Fossil, Jill Stuart, Vestal & more - Up to 54% off. Sign up for 6pm.com email and get 6pm Daily Deals delivered to your inbox. Click link to get started. Enjoy flat rate shipping of $6.95 from 6pm.com. Click link to shop today. Save up to 60% on women's footwear at Finish Line. Click to save on Nike, Reebok, Asics, and more. Save up to 70% on Clearance shoes and apparel from FinishLine.com. Spend $50 or more at Tactics.com and use this coupon code to get $5 off. Shop online at JourneyEd.com and students can save up to 85% on software. Click link to start.